This weekend, the pro-independence Scottish National Party (SNP) meets in Glasgow for its fall conference. After more than a decade in power at Holyrood – Scotland‘s devolved parliament in Edinburgh – the party continues to defy all the established rules of mainstream politics. It is still riding high in the polls; its leader, Nicola Sturgeon, remains Scotland’s most commanding politician; and, in the event of a snap Westminster election, it would stand a good chance of reversing the losses it suffered last year at the hands of Labour and the Tories.However, in recent months, the remarkable durability of Scottish nationalism has come under increasing strain. 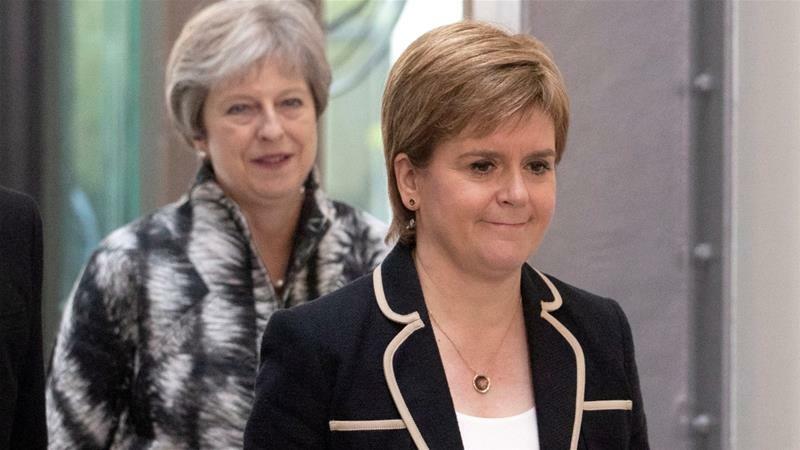 The SNP faces two significant, even potentially critical, challenges.The first relates to independence: Sturgeon has to decide whether or not to stage a second referendum on separation from the UK. The first, in September 2014, returned a close-run victory for the union.For a while, her plan was to hold “indyref2” shortly before Britain leaves the EU in the spring of next year, with the aim of rescuing Scotland’s membership of the European bloc. But the rapid shift in favour of independence that Brexit was expected to provoke among Scotland’s staunchly europhile electorate simply never materialised. As a result, Sturgeon has been forced to reassess her strategy, leaving many nationalist campaigners waiting anxiously for a poll that could be delayed for years – or, indeed, called at a moment’s notice.The second – and arguably more acute – problem for the SNP is the #MeToo controversy that currently surrounds Sturgeon’s predecessor, Alex Salmond.Over the summer, it emerged that two separate allegations of sexual misconduct had been made against Salmond by Scottish government staff members dating back to his time as SNP leader and Scottish first minister. Unhappy with the way the claims had been handled internally by civil servants, Salmond launched a dramatic legal action against his successor’s government. He then abruptly quit the SNP and set up a crowd-funder to cover his legal costs which directly, and perhaps cynically, linked his fate to that of the Scottish independence movement as a whole.The fallout from this decision has, to put it mildly, divided nationalist opinion. Some activists believe Salmond is trying to leverage his political clout in an attempt to intimidate his accusers, while others – including senior party figures – see him as the victim of an opaque anti-nationalist conspiracy; the crowd-funder raised $131,200 in three days before Salmond closed off donations.Sturgeon, whose working relationship with Salmond stretches back to the 1990s, has dealt with the issue as sensitively as possible. The complaints should not be “swept aside because of the identity of the person involved,” she said at the outset of the crisis, in reference to her ex-boss, and the ongoing police investigation into Salmond’s conduct must be fair to “all parties concerned”. Nonetheless, the SNP now finds itself in a deeply uncomfortable position: just as the UK government’s Brexit negotiations with the EU reach the breaking point and grassroots demands for a second independence referendum escalate, the party has been plunged into a bitter dispute over the behaviour of its “talismanic” former leader.Sturgeon is grappling with obstacles on the domestic policy front, too. Last month, one of her administration’s flagship education reforms – standardised testing for pupils in their first year of primary school – was defeated in parliament. And a recent report into the economics of independence commissioned by the SNP and led by Andrew Wilson, a private sector lobbyist with close ties to the party leadership, came under heavy fire from the left for its putative commitment to spending constraints and fiscal discipline.All these factors have contributed to a growing sense of restlessness and inertia among supporters of Scottish independence.In the absence of a clear roadmap to national sovereignty, the so-called “Yes” coalition that brought Scotland within touching distance of independence four years ago has retreated back into its respective ideological subgroups.In particular, the gap between traditional nationalists who view independence as key to the survival of Scottish cultural identity and left-wing activists who see it in more practical terms – as a constitutional mechanism for social and economic change – has never been more obvious or entrenched. This matters because, until now, unity had been the cornerstone of nationalist success. In the face of concerted attacks by the British political and media establishments, SNP campaigners remained rigidly focused on one thing: independence, even as other major UK parties – notably, the Conservatives over Brexit and Labour over Jeremy Corbyn‘s leadership – collapsed into acrimony. It would be an exaggeration to say that unity had vanished completely: dozens of autonomous “Yes” groups are still active across Scotland and the SNP is conducting a series of member-led “national assemblies” in a bid to coordinate planning for the next referendum, if and when it arrives.But the adhesive is visibly beginning to wear off. And if the independence movement splinters apart now, no one, not even Nicola Sturgeon, will find it easy to piece back together again.